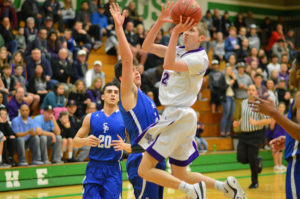 A lot of different factors contributed to North Thurston High School’s record-setting boys basketball season this year. The Rams, who opened the season by winning their first 19 games, had an overwhelming abundance of senior leadership, featured two of the top scorers in program history, possessed a number of prolific shooters, had a swarming defense that could rattle even the most focused teams and were as apt as anyone in being able to turn an opponent’s turnover into an easy basket with their lightning-quick transition game. 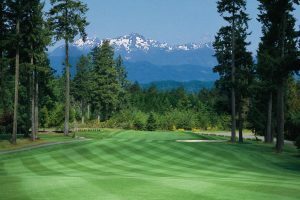 Yes, North Thurston had a number of strengths this season and you would be hard pressed to find too many holes. A lack of height and size, however, would certainly be two of the few. Unfortunately for the Rams, it was something their regional round opponent, Seattle Prep, had a stockpile of. 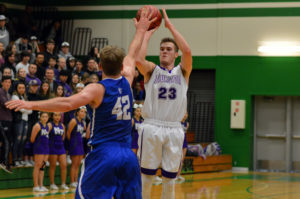 North Thurston’s spectacular season fell a game short of advancing to the state tournament for the first time since 2007 after the No. 12 Rams suffered a 60-51 loss to the No. 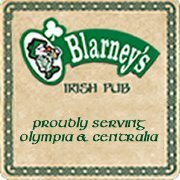 13 Panthers in a Class 3A regional playoff game on February 24 at Tumwater High School. 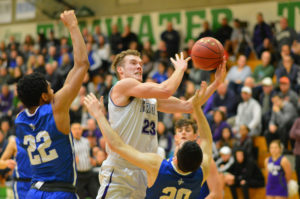 “We talked about that all year that you won’t be defined by one game, you’re going to be defined by your body of work and these kids brought it all year long,” North Thurston Coach Tim Brown said about his squad, which finished the year with a record of 21-4. There was no shortage of accomplishments for this year’s Rams, highlighted by their 19-0 start and winning the 3A South Sound Conference championship for the first time. They also advanced to the regional round for the first time since 2012, had the SSC most valuable player in senior guard Jeremy Spencer, a first-team all-conference selection in senior Clay Christian and honorable mention picks in Gunner Nielsen and Tim Tenkley. In the end, the Rams failed to have an answer for Seattle Prep’s 6-foot-11 center Nic Lynch, a Lehigh University commit who scored a game-high 25 points as he feasted on North Thurston’s frontline, which didn’t have a player over 6-4. After a shaky start, the Rams were able to cut the deficit to 25-23 at the break, but saw their offense go ice cold in the third quarter as they missed several key buckets inside the paint and a handful of costly free throws. Lynch took over on the inside, while teammate Kalu Stricklin, who scored 15 points, started to heat up from long range, connecting on a couple of 3s to help the Panthers (17-10) pull away in the second half. 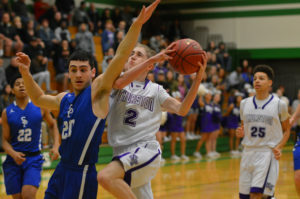 North Thurston was never able to get within 6 points the rest of the way. Tenkley paced the Rams’ offense with 21 points, Spencer added 15 points and Christian finished with 9. Christian and Spencer leave as the most prolific scoring duo in the program’s near 60-year history. The tandem finished with a combined 2,571 career points. Christian departs as the school’s all-time career scoring leader with a total of 1,495 points. He also grabbed 543 rebounds during his 94-game career with the Rams. Spencer finished with 1,076 career points, appearing in 72 games over the last three years.